Brief Description: Take part in your own private penalty shoot-out as you pit your wits against family and friends and delve into your memory banks to find the answers to 1,250 fiendish questions about Ipswich Town – even the most ardent fans will find themselves hitting the crossbar instead of the net. Covering the whole history of the club, including leading goalscorers, transfers, managers, squad numbers, Cup competitions, League positions, awards, legendary players and a whole host of other challenging topics, it is as much an education as it is entertaining. With a fitting Foreword by David Sheepshanks, Chairman of Ipswich Town Football Club, and brimming with interesting facts and figures, you will be drawn into hours of reminiscing about the highs and lows that have shaped the club over the last century. Special Note: £1 from every copy of the book sold will go to 'Ipswich Town Community Trust'. About the Author: John DT White has been a sports fan since he was able to kick a ball around the streets of Belfast. George Best was his boyhood hero and has supported Manchester United all his life. The author currently lives in Belfast with his wife Janice and his two sons, Marc and Paul. 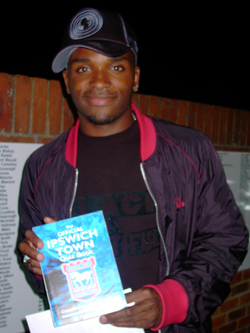 (Photo: Darren Bent holding 'The Official Ipswich Town Quiz Book'). An excellent set of questions that I'm sure will be well received by Ipswich fans, young and old, good luck with the book - it's going to be a hit! The players would spend many a long coach journey to and from away games testing each others sporting knowledge during my nine years at Ipswich Town. The journeys would have seemed so much shorter if this book had been around then. A great test of your allegiance to the club, for both the supporters and the professionals. Well done. I think the quiz book is very good, the questions cover a wide variety of the history ‘past and present’ of Ipswich Town Football Club. To answer them all you must have a great knowledge of Ipswich Town. This book really tested my memory of the great Ipswich Town, past players, matches and successes. 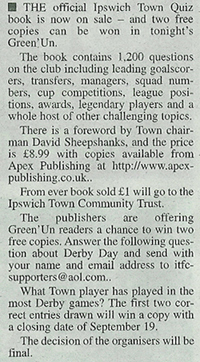 It is a must for all Ipswich fans, young and old, and it's nice to see that Apex and the author are donating money to the Community Trust from each book sale. For all Town fans, young and old. For the young - their heroes of today, for the old - thinking caps on with fond memories. A must for all Town fans everywhere! While giving the average supporters some great questions the author has challenged the most ardent of supporters with some very difficult questions. A must for any quiz minded Tractor Boy. 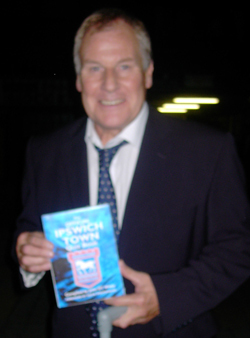 (Photo: Joe Royle holding 'The Official Ipswich Town Quiz Book'). How generous of the author, John DT White, and Apex Publishing to donate £1 to Ipswich Town Community Trust for each sale of this brilliant book. I have no doubt at all that the Trust will receive a huge donation, as so many copies will be sold - after all, what true blue fan will be able to resist buying it! It's a mine of information, and it has that fascination of self discovery into what you really do and don't know about the Club. It's a real must-buy! 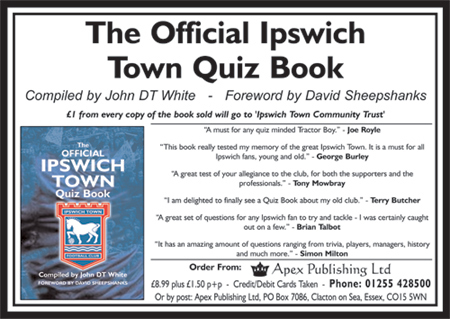 A great set of questions for any Ipswich fan to try and tackle - I was certainly caught out on a few, this book will be great for down the pub and amongst friends, a must book for any Town fan, nice to see that £1 from each sale is going towards the Community Trust. A hugely enjoyable book. A must for all Ipswich Town fans. Lots of great memories from my own playing days at Portman Road! 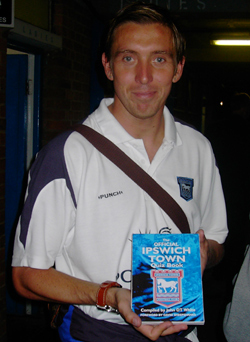 (Photo: Matt Holland holding 'The Official Ipswich Town Quiz Book'). 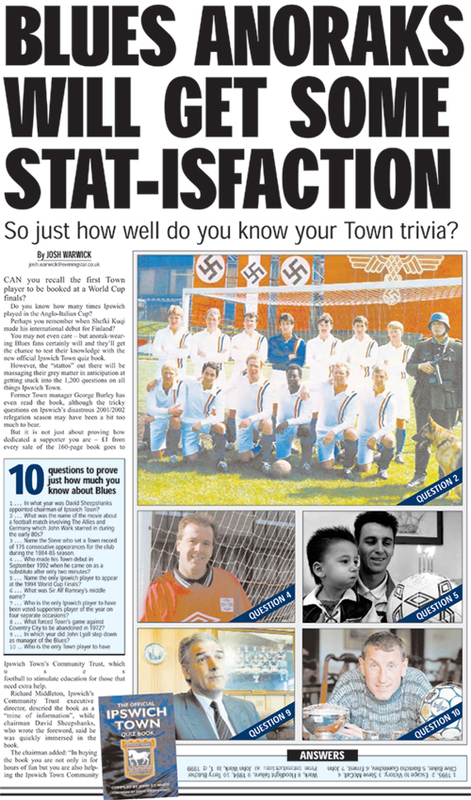 A must for any Ipswich Town fan with an interest in quizzes. 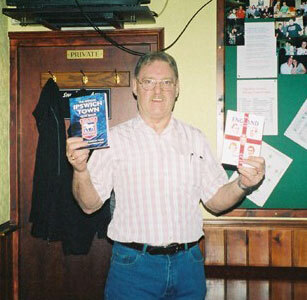 (Photo: Geraint Williams holding 'The Official Ipswich Town Quiz Book'). Fun for all the family, fans will read this book for hours. 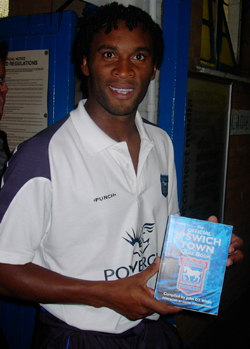 (Photo: Fabian Wilnis holding 'The Official Ipswich Town Quiz Book'). 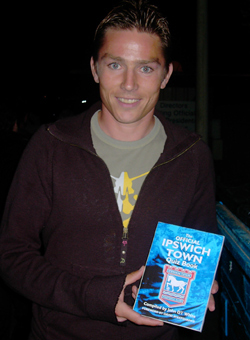 (Photo: Darren Currie holding 'The Official Ipswich Town Quiz Book'). 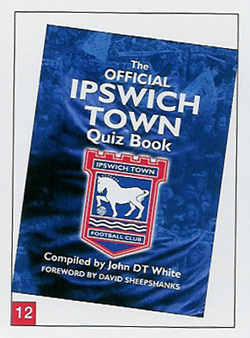 Welcome to the definitive Ipswich Town Football Club Quiz Book! 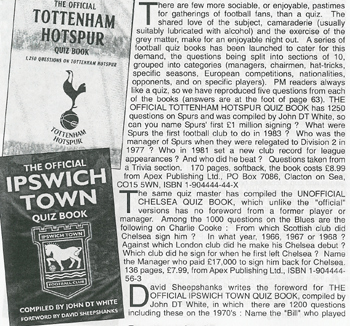 In the following pages you will find a plethora of quiz questions to test even the most knowledgeable of Town Fans. When asked to write this foreword I requested an advance copy on receipt of which I found myself quickly and totally immersed in the content, testing myself and, all too often, flicking to the back for the answers! I am sure you will enjoy this book as you challenge yourself and friends. 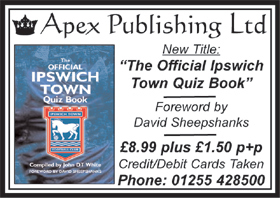 I would like to thank Apex Publishing for agreeing to donate £1.00 for each and every quiz book purchased to our own Ipswich Town Community Trust. As you may know, our Community Trust is now a registered charity in its own right, a subsidiary of the Club but operating with its own distinct Board of Trustees. Its objectives focus on LEARNING, ACTIVE and LIVING being the areas in which we are capitalising on the power of football to stimulate education for those that need extra help, football opportunity for thousands of young people who just want to play the game and a healthy lifestyle, diet and fitness awareness for just about all of us! So, in buying this book you are not only in for hours of fun but you are also helping the Ipswich Town Community Trust, which plays such a vital part in helping to grow and perpetuate our fan base amongst old and young alike. I am truly delighted that John has dedicated the first ever Ipswich Town quiz book to myself and my players who lifted the UEFA Cup in 1981. It is hard to believe that it is almost 25 years since that wonderful evening when we made the people of Ipswich extremely proud. 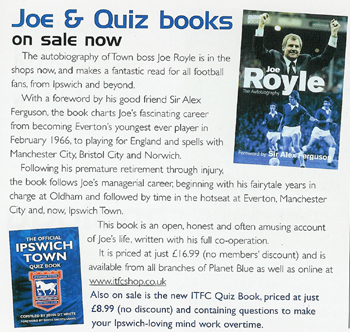 I am also happy to see that £1 from every copy of this book sold is going to 'The Ipswich Town Community Trust.' Therefore, when you buy this book you will not only be increasing your knowledge of the club, but you will also be helping a very worthwhile and deserving cause with your donation. The book is a must for all Town fans and is packed full of teasing questions that will no doubt cause and even settle a few arguments. It has an amazing amount of questions ranging from trivia, players, managers, history and much more. I'm sure this will prove to be a big hit with Town fans of all ages and may find its way onto the supporters coaches for the long away trips during the season. The publishers are also donating £1 from every book sold to The Education and Sports Trust at Ipswich Town, which I think is a fantastic gesture. I think they have a winner on their hands! This is a great quiz book and something all Ipswich fans would enjoy reading, I think most fans will probably find out they don't know as much about the club's history and players as they thought they did ... like me! The £1 donation is a great idea. If you thought you were a Ipswich Town 'know it all' this book will make you think again. A real test for football quiz boffs! A fascinating book that is sure to appeal to Ipswich fans from all generations and a publication that will no doubt cause and solve many Ipswich Town arguments. Having spent the vast majority of my playing career at Ipswich Town, I am delighted to finally see a Quiz Book about my old club. What’s more, £1 from every copy of the book sold is going to the Ipswich Town Community Trust, an excellent reason why all Town fans should buy the book. 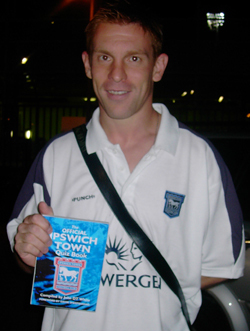 (Photo: Richard Naylor holding 'The Official Ipswich Town Quiz Book'). I am delighted to offer my support to John’s book and not only because like me he is from Northern Ireland, but because his book is also helping 'The Ipswich Town Community Trust.' A most enjoyable read from first page to last. 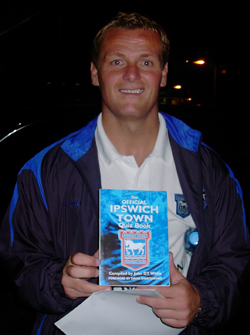 (Photo: Jim Magilton holding 'The Official Ipswich Town Quiz Book'). A very good quiz, great mixture. I do a lot of quizzes and this is as good as any. 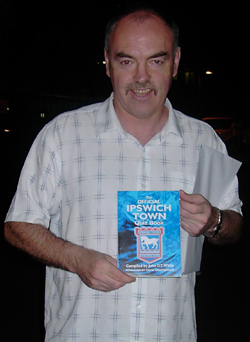 (Photo: John Wark holding 'The Official Ipswich Town Quiz Book'). 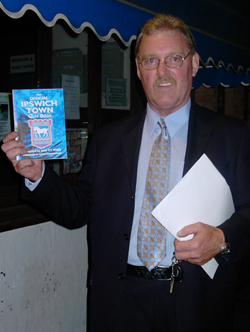 (Photos: Kevin Beattie holding 'The Official Ipswich Town Quiz Book'). 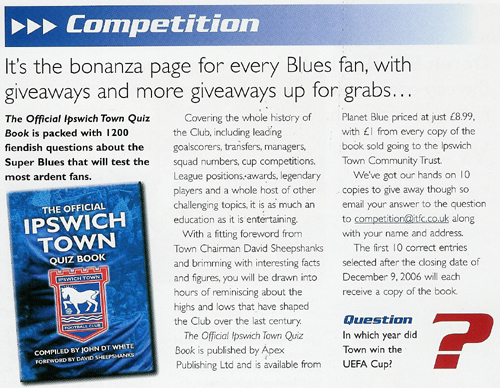 The Official Ipswich Town Quiz Book is packed with 1,200 questions about the Super Blues that will test the most ardent fans. I challenge any Town fan to read this book and not come to the conclusion they actually know very little about their club. A real challenge for even the most well-read Ipswich fan. The questions range quite well in terms of difficulty which is good and it would pose a challenge to almost all ITFC fans. A fine book that will while away the long hours travelling to far flung away matches. This book will provide hours of fun for all Ipswich Town fans. A great quiz book about a great club. Some real brainteasing questions that will keep Town fans on their toes. Sure to cause some disagreements on matchdays between True Blues. Great to see £1 from every book sold going to The Education and Sports Trust at Ipswich Town, so get your order in and support the club. A must for Town supporters of all age. ever have, this book is for you. It's packed full of tough questions that you know you "should" be able to answer, when I read through I had some real "it's-on-the-tip-of-my-tongue" moments. Great to see that £1 for each copy sold is being donated to Ipswich Town Education and Sports Trust too. A must for any Ipswich Town fan. Very distracting in our office as we are full of tractor boys! How well do you know the Blues? This book should carry a warning to the effect that once you open it nothing else will get done that day. 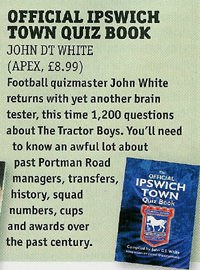 Football quizmaster John White returns with yet another brain tester, this time 1,200 questions about The Tractor Boys. You'll need to know an awful lot about past Portman Road managers, transfers, history, squad numbers, cups and awards over the past century. This book is full of all the sort of trivia I used to know. It’s the most comprehensive collection of trivia questions I’ve ever seen about the Tractorboys. If you love trivia and Ipswich then this book is a must. I can safely say this book contains some of the best Ipswich Town related questions I’ve ever read, the questions contain trivia that will test the most knowledgeable Town fan any where in the world. To date there are six books in this series of football quiz books. 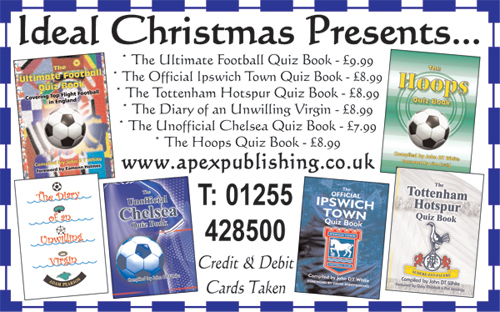 The Ultimate Football Quiz Book, The Unofficial Chelsea Quiz Book, The Hoops Quiz Book, The Official Ipswich Town Book, The Tottenham Hotspur Quiz Book and The West Ham United Quiz Book. Each contains a mixture of easier, moderate and tough questions to suit the complete range of supporters and readers. The names of either men who were co-founders of Blackburn Rovers won't come easy, while the name of the trophy that Birmingham City won in 1991 will tease some; but I suspect most of us know where Arsenal play their home games. All three questions can be found in the 256-page 'The Ultimate Quiz book' (priced £9.99), which contains 2,000 questions on top-fight football in England. It has been compiled by John D T White, with a foreword by Eamonn Holmes. White also compiles all but one (the one on Hammers) of the other books in the series. Helping to sort the men out from the Bhoys we are asked: Can you name the last Celtic player to score in successive Scottish Cup finals? This is one of 1,500 questions on Celtic that are spread over 198 pages, with the foreword by Jim Craig. This book is priced £8.99. Among the 1,250 questions in the 162-page Tottenham Hotspur book (priced £8.99) we are asked to name the striker who scored in the 1984 UEFA Cup final shoot-out and never played for the club again? Gary Mabbutt and Pat Jennings ought to know and they also wrote the foreword. I bet it's not only Suffolk-based football fans who remember the name of the man who scored the winning goal in the 1978 FA Cup final. This is one of 1,200 questions in the 160-page Ipswich book (priced £8.99). David Sheepshanks contributed the foreword. Among the 1,000 questions in the 134-page Chelsea book (priced £7.99) is: What manager did Steve Clarke fall out with after he was replaced in the team by Gareth Hall? Chris Cowlin compiled the 1,000 questions on West Ham (134 pages, priced £6.99), with Julian Dicks contributing the foreword. I bet Dicksy doesn't know who was West Ham's highest goalscorer in their triumphant European Cup Winners' Cup run of 1964-65 - but I did. Honest! The answers to the eight aforementioned questions can be found on the bottom of page 31. 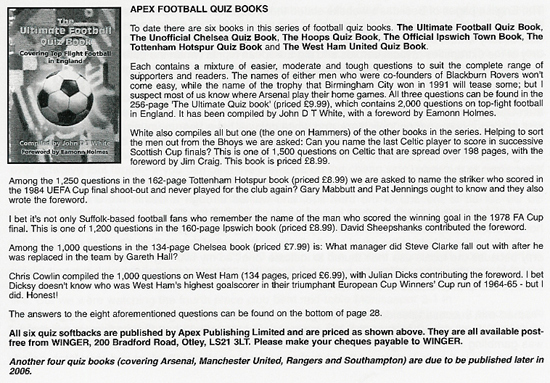 All six quiz softbacks are published by Apex Publishing Limited and are priced as shown above. They are all available post-free from WINGER, 200 Bradford Road, Otley, LS21 3LT. Please make your cheques payable to WINGER. 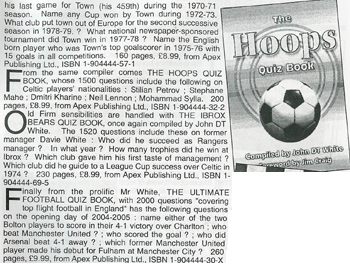 Another four quiz books (covering Arsenal, Manchester United, Rangers and Southampton) are due to be published later in 2006. (1) The co-founders of Blackburn Rovers were John Lewis and Arthur Constantine. (2) Birmingham City won the Leyland DAF Cup in 1991. (3) Arsenal play their home games at Highbury. (4) Lou Macari was the last Celtic player to score in successive Scottish Cup finals. (5) Steve Archibald scored in the 1984 UEFA Cup final shoot-out and never played for Spurs again. (6) Roger Osbourne netted the only goal in the 1978 FA Cup final. (7) Steve Clarke fell out with manager Bobby Campbell. (8) Brian Dear netted four goals to be West Ham United's leading scorer in the their 1964-65 European Cup Winners' Cup run. An Ipswich Town supporter's pub-quiz bible. 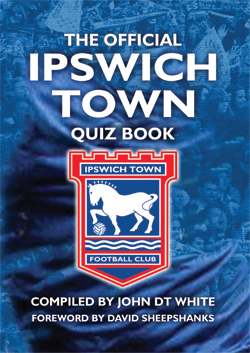 * THE official Ipswich Town Quiz book is now on sale – and two free copies can be won in tonight’s Green’Un. The book contains 1,200 questions on the club including leading goalscorers, transfers, managers, squad numbers, cup competitions, league positions, awards, legendary players and a whole host of other challenging topics. There is a foreword by Town chairman David Sheepshanks, and the price is £8.99 with copies available from Apex Publishing at http://www.apexpublishing.co.uk. 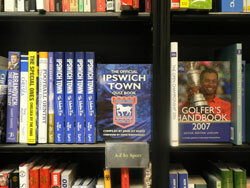 From every book sold £1 will go to the Ipswich Town Community Trust. The publishers are offering Green’Un readers a chance to win two free copies. Answer the following question about Derby Day and send with your name and email address to itfcsupporters@aol.com. What Town player has played in the most Derby games? The first two correct entries drawn will win a copy with a closing date of September 19. The decision of the organisers will be final. 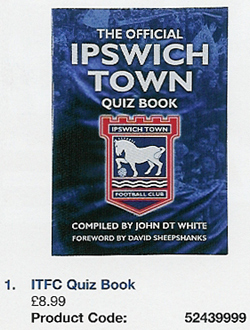 It was an honour to be asked to assist in the completion of the first ever Ipswich Town quiz book. As creator of the Pride of Anglia website the feedback I receive from visitors, and indeed the sites 'hit' count, indicate a very healthy interest in the history, statistics and trivia associated with East Anglia's finest club. 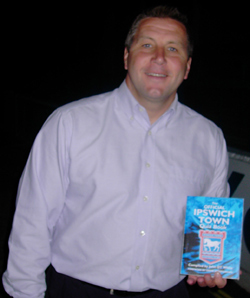 John's book I am sure will provide many hours of entertainment to those with an insatiable interest in all things ITFC. Singing The Blues is pleased to bring you a brief review of the fourth coming official Ipswich Town quiz book. The book is 1,200 questions, compiled by John White and they cover virtually everything from Towns 127 year history and I mean every thing, even squad numbers and final league standings. The book has a foreword from Town chairman David Sheepshanks (and more importantly has a few words from me and webmasters from various other Ipswich Town fan sites and resources) it is being published by Apex Publishing and will go on sale from the clubs planet blue stores in mid September costing £8.99 with £1 from the sale of each book going the Ipswich Town community trust, but if you don’t want to spend £8.99 on a truly great book I have some good news for you, STB will be giving away 3 copies of book in the near future. 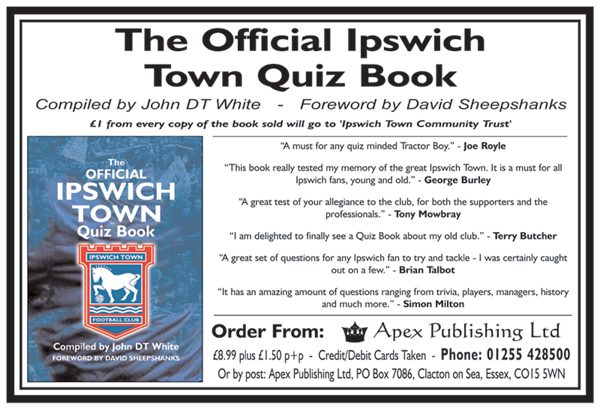 "The Official Ipswich Town Quiz Book"
This book is a must-have for any Ipswich Town fan - it's also a great tool for us! 10 copies were given away in a competition on the David Rees show. 'The Mark Murphy Show' (BBC Radio Suffolk), ran a competition where they gave 5 copies of the book away, these were provided by Apex Publishing Ltd.
Great book! It really gets the memories flooding back. I found myself able to answer quite a few questions initially, but as I got deeper and deeper into them, I found they got tougher and tougher. A good mix of easy, "on the tip of my tongue", and brain boilingly difficult questions. There's also a good mix between current stuff, which will appeal to younger fans, and stuff on the history of the club that appeals to old farts like me and my Dad.There's already been lots of e-mails and phone calls between me and some friends over some of the questions. A great quiz book, this really tests the memory to the full - a must for all tractor boys and girls. I think on the whole they are a good set of questions. I like the mix between specific topics and general trivia. I also thought that there was a good mix between questions for younger fans, and those with longer memories. I felt also that the standard was well set, and I was very pleased with the number of answers I knew straight off. 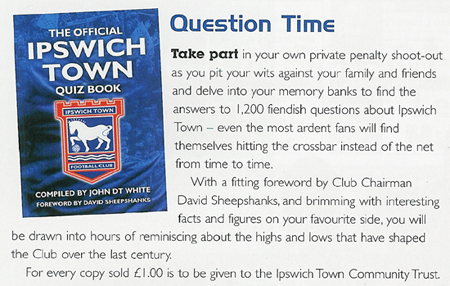 An excellent idea - a book full of questions on Ipswich Town. Good variety of topics and mix of questions to test fans of all ages. A must for all birthday or Christmas present lists and £1 goes to the Education and Sports Trust per book. I have to say that it is a very thoroughly researched book, an impressive level of information which will undoubtedly have even the most ardent Town fan scratching their heads. Many of the questions sparked wonderful trips down memory lane! I think the whole principle of an ITFC quiz book is great. As a branch, we often have impromptu quiz nights and I am sure we would use this book as an ice-breaker. I thought the structure was spot-on. Small sections, but lots of them. Pick and choose the topic to suit the mood. Great. I thought I knew a lot about ITFC and the players, but it is surprising how much you don't remember when put on the spot. It is obvious that a huge amount of research has gone into the book and it will give the real ITFC fans hours of fun and head scratching. I highly commend The Official Ipswich Town Quiz Book, great stuff. A must for all real Tractors, guaranteed to keep you busy for hours. This book is very good indeed. A very impressive and comprehensive set of questions! Would make an ideal Christmas gift for supporters of any age. I am amazed at how much I remembered and the good memories triggered by reading the questions! 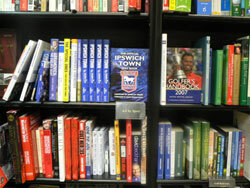 'The Official Ipswich Town Quiz Book' on sale at Waterstone's, Ipswich. 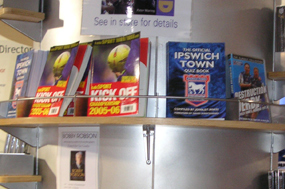 'The Official Ipswich Town Quiz Book' on sale at the club shop, Portman Road.